National building cluster r. a. The National cluster of civil engineering is a cluster of small businessmen in the construction sector who, thanks to their cooperation, get much further than they would work on themselves. Orders are held in a circle of members, creating an alternative to big companies. 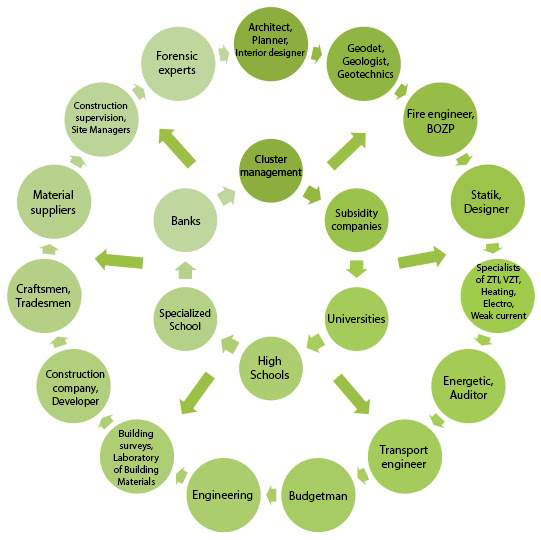 Each wheel in this diagram means a limited number of members so that there is no unnecessary competitive pressure within the cluster. The cluster will benefit from modern information technologies that allow quick and easy collaboration without having to sit up. November 26, 2018 Press release for project "Documentation of project intent - NSKlastr"